Memories of the grey days of winter fade into our distant memory as we drive the Niagara Parkway to the beautiful town of Niagara-on-the-Lake in Ontario where spring has sprung. With our friend in tow, we head off from Brantford for a day tour of the canals, waterfalls, and spring blooms of Ontario. The first destination on our list is an incredible feat of engineering - the Welland Canals system. From Lake Ontario, the canal with it's series of 8 locks, hoists huge container ships up and over the Niagara Escarpment to Lake Erie - a height of nearly 100 metres. Soon after arriving at the St Catharines Museum, a large freight ship was lining up to enter lock 3 so we headed outside to the elevated viewing platform to watch. It's incredible to see one of these huge ships enter the locks with very little room for error - the locks are not much wider than the ships. Once securely inside the lock the doors are closed behind it and the lock is filled with water - and the ship steadily rises until it reaches the same level as the southern body of water along the canal. We continued on towards Niagara Falls - although we didn't go right to the falls since we'd visited only a few weeks earlier. We joined up with the Niagara Parkway and skirted the Niagara River as it wound through the outer neighbourhoods of Niagara Falls towards the Whirlpool Rapids and home of the Spanish Aero Car. With time marching on, we didn't have time to take in an aerial view from the Aero Car but instead we drove to the other side of the elbow (in the river) for a different perspective. The Niagara Parks pretty floral clock was another subject to point the camera at and take the time to admire the design and layout of the flower beds. Next was the quaint town of Niagara-on-the-Lake, a town which never fails to impress me - it has a really nice feel to it (quite civilised indeed)! 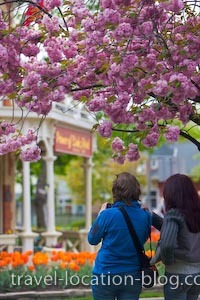 It also never fails to make me feel like summer with its rampant spring tree blossoms and vibrant tulips. The streets are also lined with unique boutiques and the iconic Prince of Wales Hotel - a historic landmark which was established in 1864. After wandering the main street of Niagara-on-the-Lake and picking up an ice cream along the way - it was time to head back to Brantford and then onto Toronto for a night out on the town with our friends.